I rose from the floor, a skinny and plain afterbirth. I found Sean in his apartment, and he was utterly confused when I broke down and cried. I told him of Jekyll’s elixir. That I was a fool. 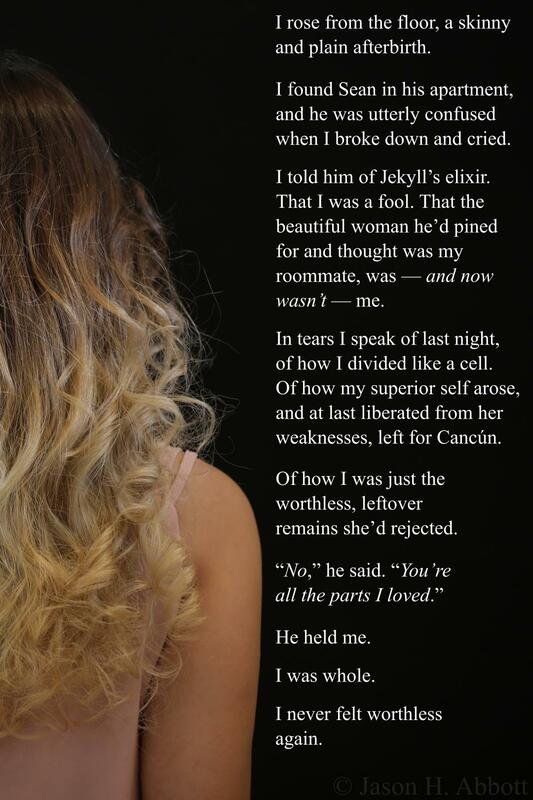 That the beautiful woman he’d pined for and thought was my roommate, was — and now wasn’t — me. In tears I speak of last night, of how I divided like a cell. Of how my superior self arose, and at last liberated from her weaknesses, left for Cancún. Of how I was just the worthless, leftover remains she’d rejected. I never felt worthless again.